When most of us think about visiting a Caribbean island, the first thing that probably comes to mind is relaxing on a beach, toes in the sand, and a cold drink in our hand. On a recent visit to the island of Anguilla, those thoughts were secondary for Jenny Witt, an Analyst II at Miami’s IT Services Support Desk. Anguilla is located in the Lesser Antilles, lying east of Puerto Rico and the Virgin Islands and directly north of Saint Martin. For Witt, this was not her first time visiting the small British territory. “I have an Anguillan friend who had organized a program to obtain some computers for the school kids there, most of whom have no access to computers,” she said. So on her return trip, she did not come empty-handed. “I was able to donate two computers and also took a lot of school supplies with me,” she noted. According to Witt the schools there need a lot of what we consider basic school supplies: items such as pencils, sharpeners, rulers, and dry erase markers. The Support Desk was not Witt’s first stop when she began working at Miami. 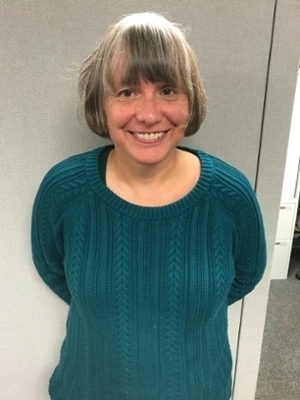 “Prior to working in IT Services at Miami, I worked in Access Services at King Library as a Circulation Desk Supervisor.” Before Miami, Witt worked in a variety of fields, doing all kinds of different tasks. “In the past, I have worked as the activities director at a nursing home, bookseller, blueberry picker, barista, Avon representative, mystery shopper, donut maker, photo developer, and Zoology lab assistant.” Literally the A - Z of jobs. Witt’s educational experience is similarly diverse, receiving her A.S. in Computer Science from Indiana University, and a B.A. in psychology from Miami. While at IU she also worked as a math tutor and supplemental instructor for computer science. Witt also has a diverse set of hobbies, enjoying everything from fishing to science fiction, playing the piano to traveling, along with computing and aquaria. There is another teaching area on the island that Witt is hoping to make an impact with in the future. “My friend also runs the Marine Life Education Foundation which includes taking the children on field trips on his glass-bottomed boat. I am interested in assisting with this program and may have the opportunity to help out,” she said. She also noted that there are opportunities for anyone within the Miami community to help, and if you are interested, just let her know. I wouldn’t bet against Witt going back there again either. “I intend to continue helping by gathering supplies, donations, etc. I am especially interested in getting them computers, naturally,” she says with a smile.